Hosted VOIP « Genesis Telecom Ltd. Simply put, VoIP telephony is phone service over your internet connection. This has multiple benefits including reduced costs and higher call quality. Your business costs are lower as you won’t be paying for a separate service from a local telephony company and as the service is transmitted over high-speed internet, calls with VoIP telephony will be clearer with far less audio loss. What are the benefits of using VoIP Telephony? There are multiple benefits to using VoIP telephony within your business. The first and often the main reason for switching to VoIP is for the money saving benefits, unlike Public Switched Telephone Networks (PSTN), long distance calls become far more inexpensive on a VoIP line as the call is transferred over the internet and not through traditional phone lines. VoIP telephony also has feature-based benefits like conference calling within your business and the ability to make video calls and transfer files and images while on calls. VoIP is also simple to set up and therefore makes upgrading a fast and efficient process, it can even be integrated with an existing phone connection. All of these benefits of using hosted voice add up to make your business a more productive and successful place. Why get your business’s VoIP telephony service with us? 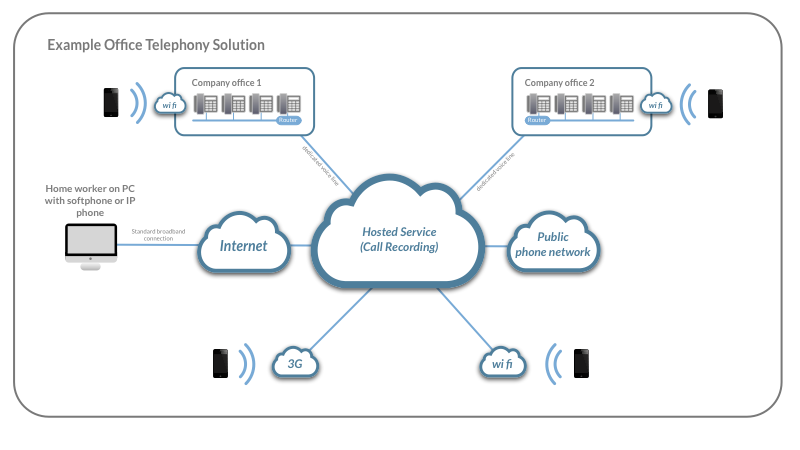 Genesis’s Hosted Telephony features are extensive, affordable and reliable. Gives you the ability to move a call from your desk phone to your mobile seamlessly, and then back again! “We had to relocate our office due to redevelopment and the most important thing to our company was keeping the phone numbers we had used for the last 15 years intact, ensuring we never missed a client. Thanks to Genesis we have now upgraded our telephone system, provided each employee with a tailored experience and call handling package, and saved on average about 25% off our monthly bills.” – Alufix (UK) Limited. Genesis will work with you through every step of the installation process, from providing network, telephony and VoIP assessments and full site qualifications and deployment. We are a reliable and capable Hosted Telephony provider based in the UK, if you need any more information or advice on how to choose the right VoIP service for your business, please call us on 0843 504 4180 and one of our friendly team member can answer any questions you have on hosted voice services.